Size of this preview: 716 × 600 pixels. Other resolution: 740 × 620 pixels. Sailor W.R. Martin points out details of the Japanese trophy flags painted on USS Boises pilothouse as a scoreboard of enemy ships claimed sunk in the Battle of Cape Esperance, 11-12 October 1942. 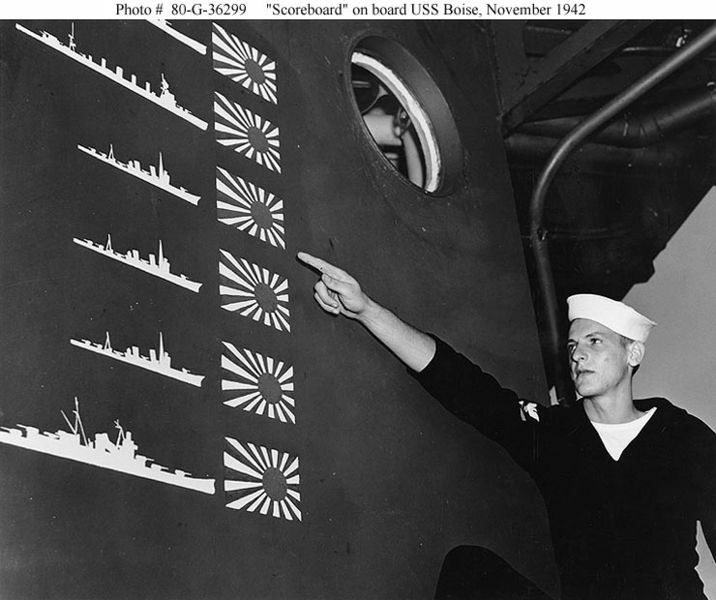 The six Japanese ships (two heavy cruisers, a light cruiser and three destroyers) represented in this scoreboard greatly overstates the actual enemy losses, which were one heavy cruiser (Furutaka) and one destroyer (Fubuki) sunk and one heavy cruiser (Aoba) badly damaged. This over-claiming was typical of contemporary night surface actions. This page was last modified on 23 July 2018, at 15:25.